And anti-Muslim hate at street level ‘male on female abuse and anti-Muslim hatred and bigotry’. For many years now the Muslim communities in the UK have suffered anti-Muslim incidents. A project called Measuring Anti-Muslim Attacks (MAMA) now allows people from across England to report any form of anti-Muslim abuse. And the TellMAMA part of this is a portal where Muslims who face abuse may address their concerns and record any incident that they experience as a result of their Muslim faith or someone perceiving them to be Muslim. This project also works with police forces across England, Wales and Scotland in order to ensure access to justice for victims through the prosecution of perpetrators. 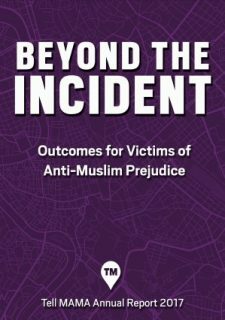 Tell MAMA released its Annual Report for 2017 earlier this week at an event in the House of Commons, and it shows the highest number of Anti-Muslim incidents to date – and the majority of victims at street level are women and the majority of assaults have been carried out by white men. In 2017 Tell MAMA recorded a total of 1,330 reports. Of these reports, 1,201 were verified as being anti-Muslim or Islamophobic in nature and as having occurred in the UK between January and December 2017. More than two-thirds of verified incidents occurred offline, or on a street-level (70 per cent, n=839), which represents a 30 per cent rise in offline reports when compared to the previous reporting period (n=643). An offline, or street-level, incident means that the incident occurred in-person between a victim (or property) and a perpetrator. There were therefore more street incidents of anti-Muslim hatred reported into Tell MAMA. Crimes or incidents that are classified as ‘online’ occurred on social media platforms such as Facebook or Twitter, or on other Internet-based platforms, were verified as having happened within the UK, and account for a third of reports in 2017 (n=362), which represents a 16.3 per cent rise in reports when compared to the previous year (n=311). This small rise can be partially attributed to the way in which ideologically-motivated accounts felt emboldened by major trigger events, (such as terrorist attacks) and broader Islamophobic discourses in the public sphere. The ‘online hate’ figure, however, should be viewed as part of a wider trend in the datasets where there has been a marked shift towards more serious offline incidents such as physical attacks, threatening behaviour and abuse more generally, along with a growing awareness of Tell MAMA in Muslim communities, among key stakeholders, and partners, resulting in a greater willingness amongst victims and witnesses to report. Tell MAMA has also listed in its annual report examples of ‘Twitter bots’ that have sought to cause disruption and division in community perceptions and which have actively promoted anti-Muslim hatred. One such Twitter account was @DavidJo52951945. Responses to the rhetoric on this account called for violent action against Islamic institutions – and on 30 August 2017 the Times reported that this bot originated from Russia. A Twitter account called @SouthLoneStar, which had amassed some 16,500 followers, was responsible in starting a global trend after the Westminster terrorist attack. The @SouthLoneStar account made several tweets about the terror attack on Westminster Bridge before sharing the photo of a Muslim woman on a mobile phone walking across the bridge just after the vehicle that caused the incident had mown down pedestrians. It used the major hashtags (#PrayForLondon and #Westminster) to post tweets which described Islam as a ‘cult of death’ and added the #BanIslam hashtag. An earlier tweet called for Islam to be ‘outlawed’. An archive of the @SouthLoneStar account in January 2017 revealed many pro-Trump tweets and how the account had followed a far-right account named @pepethetroll, which remains active on the platform. Nor was the anti-Muslim content specific to the United States – or even Britain. Further archive research of the account reveals that the @SouthLoneStar had attempted to stir-up anti-Muslim views in other European countries. For example, on 11 March 2017, @SouthLoneStar used the ‘#BanIslam’ and ‘#Rotterdam’ hashtags in a tweet which shared an image of about Muslim conquests and the Crusades. While these are some examples of Twitter and social media accounts promoting direct anti-Muslim hatred, we need to maintain vigilance against the foreign interference, in these cases, emanating from Russia, which seek to promote division and intolerance in the UK. Social media agencies such as Twitter conduct a haphazard removal process for content. Tell MAMA’s report highlights inaction from Twitter even on material that glorifies anti-Muslim hatred and violence against Muslims and Islamic institutions. Twitter’s inactivity in removing anti-Muslim hate material is deeply worrying and shows a wanton lack of desire to understand this hatred on its platform. Twitter has also demonstrated to Tell MAMA its inability to stop individuals opening up new accounts repeatedly when they have been banned from using the platform. In one case, a victim had to report in eleven separate accounts for harassment and with Twitter unable to stop the creation of new accounts and even dismissing reports on the same individual when multiple accounts linked to him were reported in through the ‘reporting in’ channels for Twitter. In 2017, vandalism replaced threatening behaviour as the third most common anti-Muslim hate incident. There was a 56 per cent increase in anti-Muslim vandalism when compared with 2016, with one in ten ‘real-world’ incidents being classed as vandalism. The most widely reported anti-Muslim hate incident was classified as ‘abusive behaviour’ with the second most reported frequency of incident classed as a ‘physical attack’. This demonstrated a rise in physical intimidation and actions against Muslim faith institutions and property. Discrimination was the fourth most common anti-Muslim incident reported to Tell MAMA in 2017, with a 77 per cent increase in incidents when compared to 2016. This category included mistreatment, denial of opportunities or denial of services based on Islamophobic prejudice, some of which was institutional in nature. Consistent with previous years, the largest proportion of street-based incidents took place in public areas such as parks and shopping areas and the second most common place for incidents was public transport networks, such as trams and buses. 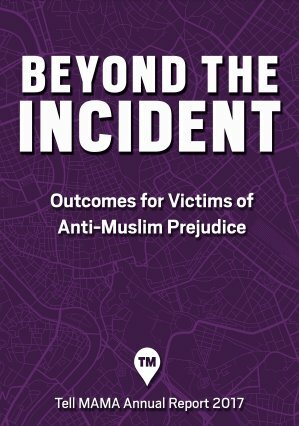 2017 data showed that at a street level nearly 6 out of 10 victims of anti-Muslim hate were women and 8 in 10 of the perpetrators were male, re-affirming previous findings over the years, that anti-Muslim hate or Islamophobia at a street level is also male on female abuse in addition to anti-Muslim hatred and bigotry. The victims were redominantly Asian females. Where age group data was available, the most common age for victims was 26-35. The most common age for perpetrators was 13-18. The director of Tell MAMA, Iman Atta OBE, said: “We are in deeply worrying times where people are looking for certainty and what they are getting is instability at a political and societal level. “This means that at times like this, minority groups are the ones who suffer the anger of those looking to vent their fears, insecurities and concerns. “We are seeing more aggressive street-based incidents, younger perpetrators, between the ages of 13-18, increased vandalism and international interference by well organised social media accounts playing groups off in the UK. “More than ever, we need to come together and redouble our efforts against those who seek to divide and play communities off against each other”.